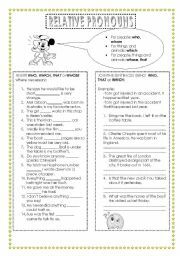 Two exercises to practise relative pronouns and relative clauses. 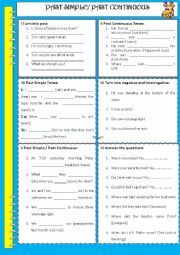 Set of exercises to practice WAS, WERE, COULD, PAST SIMPLE (regular, irregular verbs) and PAST CONTINUOUS. 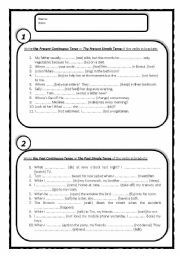 A worksheet with two fill in exercises to revise these verb tenses. It can also be used as a test. A test for young beginners. 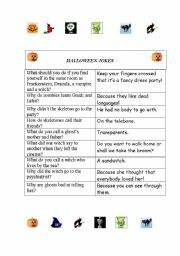 It includes vocabulary exercises (greetings, family members), grammar exercises (to be) and a short guided writing activity. 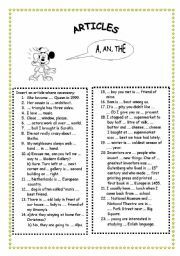 A fill in exercise to practise the use and the omission of articles. 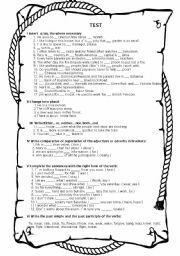 Mixed exercises to consolidate the knowledge of ARTICLES,PLURAL OF NOUNS, COMPARISON OF ADJECTIVES AND ADVERBS, VERB FORMS. 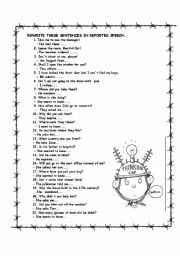 An exercise to practise INDIRECT COMMANDS, STATEMENTS AND QUESTIONS. Created to suit the needs of younger learners. By watching the animations of their favourite cartoon characters the students will easily grasp the idea of an action happening at the moment of speaking. This ppt includes 10 illustrative slides to present the grammar point(possessive case:people, animals, things) and the last slide is a fill in exercise.Suitable for visual type of learners ("pictures speak louder than words")and as a remedial exercise for weaker students. An animated presentation and two exercises to practise SOME, ANY, A or AN. GOING TO to express predictions based on present evidence or clues.